The Basilica of Santa Maria Maggiore is one of the most important and beautiful churches in Rome. It is the oldest among the great churches of the city and one of the 5 papal basilicas and one of the 7 pilgrim churches of Rome. The building stands on the Esquilin, the highest of the 7 ancient hills of Rome with about 65 meters, only about 300 meters southwest of today’s main railway station Roma Termini. The church of Santa Maria Maggiore is the largest church of the Virgin Mary in Rome, built in the 5th century AD. For more than 1500 years, the church has held a mass every day without exception. This is a world record. 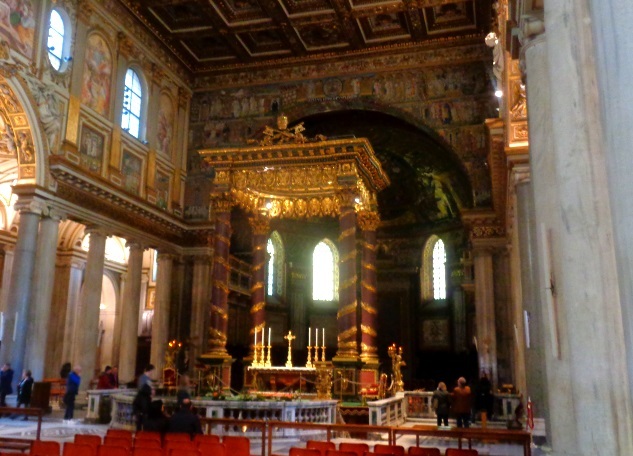 The interior of the Basilica of Santa Maria Maggiore in Rome, the frescoes, mosaics and lots of gold are well known. Quite a few experts believe that it is the most beautiful church in Rome. You can visit the church for free, opening hours are every day from 7 to 19 o’clock. You have to go through a security check in a tent outside the church. You are screened in a similar way to the airport. If you have luggage, it will be checked separately. You can then go through the main entrance to the Basilica of Santa Maria Maggiore in Rome. The first impression is overwhelming. The gigantic size and the columns on both sides impressed us very much. You can see the famous frescoes above the columns on the left and right. However, they are quite far away for the eye, since the individual pictures are not particularly large. Taking photos of the frescoes is also difficult, as there are very bright windows directly above. What’s striking is all that gold in the church. The ceilings and walls were redesigned at the end of the 15th century. The first gold brought by Spanish sailors from America was used. If you go further forward to the altar and to the famous triumphal arch around the altar, it becomes increasingly darker. Especially behind the altar windows are missing, photography with flash is not allowed. Also some chapels (side rooms of the church) can be seen. In one of these rooms several former popes are buried. In 2 chapels you can go in, others you can only see from the main church through a grid. 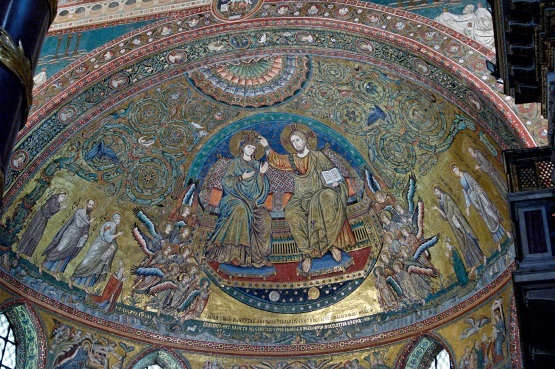 So far the free visit of the church Santa Maria Maggiore in Rome. One can still go to the museum of the basilica under the main building of the church. Here you pay 2-3 Euro entrance fee. For a few euros you can also take part in a guided tour to the first floor of the church (several times a day). 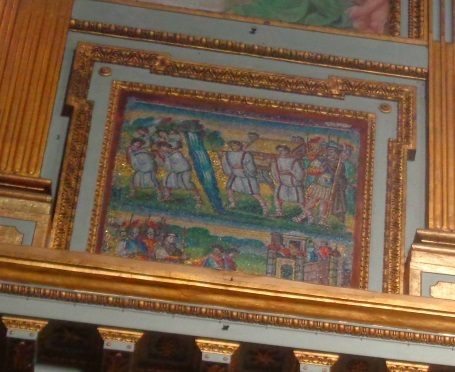 Then you can see frescoes and the famous ceiling with a lot of gold from a smaller distance. The decision to build such a large church goes back to a history. Whether it is true, we do not know: In August of the year 358 A.D. it is said to have snowed in Rome, in the middle of summer. The snow remained on the spot where the church of Santa Maria Maggiore stands today. The snow in the middle of summer was understood as a sign of God to build a church here. To this day, the church of Santa Maria Maggiore is often called Santa Maria della Neve. The Santa Maria della Neve St. Mary’s Church was completed in 432. It is the oldest larger church in Rome. However, the church was not quite as large as it is today, and the basilica was rebuilt and enlarged between the 14th and 16th centuries. Nevertheless, many things from the late antiquity (5th century) are still preserved. Very famous from this time are above all the mosaics. All the gold came into the church only in the late 15th century. Also the bell tower of Santa Maria Maggiore was built later (14th century). With a height of 75 meters it is the highest bell tower of a church in Rome to our knowledge. Ideal for visitors to the Basilica is the nearby Rome Central Station „Statione Termini“. It is only a few minutes walk from here. If you leave the main exit of the station, turn left. 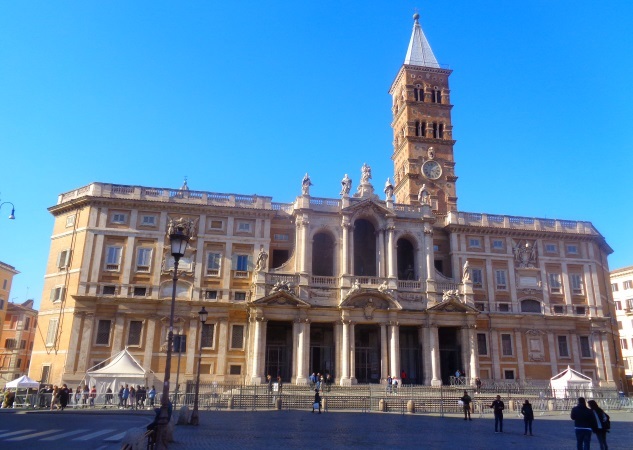 After about 200 metres you are in front of the Basilica Santa Maria Maggiore. 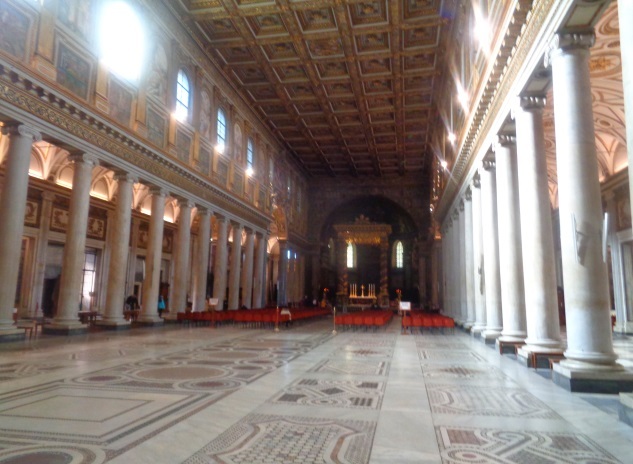 The Santa Maria Maggiore in Rome has long opening hours, about 7 am to 7 pm daily. The museum is open from 9 pm to 18:30 pm. A church service often takes place in a side chapel and sometimes also in the main church. Then you cannot enter parts of the building as a visitor for some time. There are free toilets in the courtyard for the church visitors. There is also a small shop with books on the subject and souvenirs in an adjoining room of the Basilica. A large service of the Pope personally in the church Santa Maria Maggiore is every year on Assumption Day (August 15). In our opinion, Santa Maria Maggiore is the most interesting church for visitors from Rome after St. Peter’s Basilica in the Vatican.